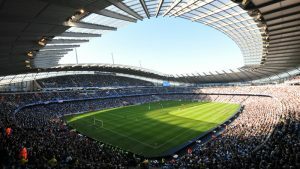 Learning more about The Manchester City F.C. – Sierra Leone Branch Team is very interesting, but gaining a little insight into some of the players that make up this team sheds a whole new light on just how important this support team is to Freetown. Santagi was discovered by Armani when Santagi was enjoying his favourite past time of playing street football. He was invited to be a part of the Man City youth team which he did and eventually moved up to the senior team. Santagi was an orphan and the opportunity to be a part of the team was of great value to him. His football position was that of a defender. His involvement in the support team gave him a chance to go back to school. Holding the position of first choice as a goal keeper for the support club is something that James is proud of. He sees his involvement with the team as an inspiration for his future endeavors. These are just two examples of the type of players that make up the support team. It gives a very clear picture as to just how critically important this support club has been not only to these players, but to the team aa well. Every player has to face his fair share of hardships, but when they come together to play the game they love so much, it gives them a chance to escape from material pleasures. Plus, the involvement for many has led them to a brighter future with one that is full of motivation and determination. For many that live in countries like the UK, US, and Canada, the value that a sport like football has is often taken for granted. It is only by becoming aware of what kind of impact football can have on a global level that it allows one to see its real value.